It’s protectionism, say Indian critics, that Congress has banned companies receiving bailout money from hiring foreigners on H-1B visas. With the economies in the U.S. and India both struggling and with unemployment rising, the outsourcing of American jobs to Indian workers has become an even more explosive issue. That’s leading business leaders, politicians, and ordinary citizens in both countries to focus on a controversial visa program, the H-1B, that allows a limited number of foreigners to work at U.S. companies for up to six years. Critics have long claimed the program allows high-paying software-writing and engineering jobs at companies and state governments to go to foreigners. On Feb. 23, the H-1B critics got a new round of ammunition. Data released by the U.S. Citizen & Immigration Services showed that in 2008, for the second year running, many of these visas went to Indian IT services companies that were sending engineers to the U.S. temporarily to work. In effect, a visa that had been designed for U.S. corporations to remain competitive at a time of talent shortage had become a blessing for the U.S. operations of global Indian companies, allowing them to send engineers from India, rather than hiring locally. The news comes at a time when many Indians already suspect the U.S. is trying to put a squeeze on the country’s successful outsourcing industry. Each year, the American government hands out 65,000 H-1B visas, and Indian engineers make up the vast majority of those receiving them. However, as part of President Obama’s economic stimulus package, Congress passed provisions to bar any U.S. company that receives bailout dollars from directly hiring workers on these H-1B visas. In India, there has been a swift outcry. "This is just irrational protectionism," says Montek Singh Ahluwalia, deputy chairman of India’s Planning Commission. "It makes no economic sense at all." In the 15 years since the H-1B began, a strong U.S.-based Indian diaspora has emerged, in part because of the visa program, to become one of America’s most successful minority groups. It has also become politically powerful within India. Many Indians in the U.S. are strong supporters of the Bharatiya Janata Party, leader of the opposition to Prime Minister Manmohan Singh’s government; U.S.-based Indians often make donations to BJP causes and lobby through its parent body, the Vishwa Hindu Parishad (Global Alliance of Hindus). Courting nonresident Indians has been a consistent fundraising tactic for the BJP and VHP, especially since a large proportion of the Indian diaspora in the U.S. comes from Gujarat, a state north of Mumbai where the BJP holds power and is more popular than elsewhere in the country. So as news trickled in about the provision in the stimulus bill, political groups in India swung into action. The VHP first asked India’s External Affairs Minister Pranab Mukherjee to see if he could arrange for Indians losing their H-1Bs to have more than the regulated 30 days to leave the U.S., allowing them to sell their houses and settle their affairs with more flexibility. A spokesman for Mukherjee says no action has been taken on that letter. Call for Indian consumer boycott of U.S.
Then, the VHP decided on a more popular approach, calling for Indian consumers to boycott the goods of 14 U.S. multinationals. Praveen Togadia, general secretary of the VHP, declines to share the list of the companies the group plans on targeting. He says a boycott is justified. "If these policies hurt Indians abroad, then we have to take steps to hurt American companies in India," he says. "The reaction must be strong, or else who knows if the legally resident Indians in the U.S. are one day thrown out." Unlike the BJP, the Indian government is trying to take a less confrontational approach, with New Delhi taking what the Overseas Indian Affairs Ministry calls a "holistic view" of the visa issue. A highly placed administrative officer in the ministry, who asked not to be identified because he is not authorized to speak to the media, said that in internal discussions the government has realized that at a time of such economic crisis internationally, asking the U.S. government to help protect jobs of Indian citizens would be counterproductive. Instead, the government wants to help Indian engineers get work in countries in the EU or elsewhere, especially if this provision hurts their job prospects. In the U.S., the H-1B remains embattled. In the late 1990s, as a shortage of U.S. engineers threatened to cut off growth for companies like Microsoft (MSFT), the U.S. government temporarily lifted the cap on H-1B visas, allowing as many 115,000 applications to be approved each year, before returning the number to the original 65,000. Microsoft Chairman Bill Gates wrote op-ed pieces in 2007 encouraging the expansion of the program to help maintain U.S. competitiveness. Other IT companies lobbied Congress for the program’s expansion, too, saying that U.S. graduate schools simply did not produce enough engineers for their companies to hire. The program has drawn sharp criticism from anti-immigration groups and unions for state employees in places like California, where the H-1B visa is used extensively to fill the jobs of civil engineers. The visa does require that the employer prove that the applicant will be paid the same salary as that of a U.S. citizen, but it does not require that the company prove that it could not find a U.S. citizen to fill that job. If, after six years of H-1B employment, the company decides to help the foreign worker get a green card, it must advertise the job extensively and then prove that applicants were of inferior quality than the current worker. It is unclear if the provision would make it difficult or impossible for Indian companies working on outsourced projects from bailout-receiving U.S. companies to hire H-1B visa employees. For now, the Indian IT lobbying group Nasscom believes that the law applies only to direct employment by U.S. companies, but "remains concerned," it said in a statement. And if, as the data now show, Indian companies doing business in the U.S. such as Infosys (INFY), Wipro (WIT), and scandal-plagued Satyam (SAY) were able to send more than 10,000 workers from India to work on projects in the U.S. last year, while Microsoft needed only about 1,000 visas and Google (GOOG) needed even fewer, the program may invite more congressional scrutiny. Enter the USA DV2014 Green Card Lottery. 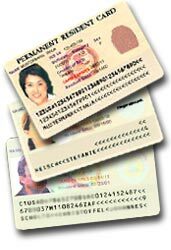 55,000 Green Cards Must Go Each Year. Take the free test to see if you qualify. If you do, apply for the USA Diversity Visa Green Card Lottery here on the official USA Diversity Lottery site. Take the free green card test.